Did you just get that boat or camper you’ve always wanted? Did you hook that bad boy up and realize your rear view mirrors don’t give you full field of vision anymore? You’ve come to the right place! This is your lucky day as this page will be your guide to the best towing mirrors for the Ford F150! We will introduce you to the top 5 best towing mirrors in the market today for your Ford F-150 truck, along with honest reviews from real buyers. For those practical buyers who want to make an educated decision, buckle up! If you want to skip the pro’s and con’s and jump down to our top 5 list, Click Here!. Before we discuss the best towing mirrors on the market, let’s first discuss what towing mirrors are. These are also sometimes called ‘dumbo ears’ or ‘wings’ by trailer or truck enthusiasts. You might often hear that towing mirrors give better visibility than regular side mirrors, but it is important to know how they do thtat. The towing mirror was designed with two parts, both with different uses. The first part of the mirror acts as a regular side view mirror, where you can see regular distances behind your truck. The second part, which is actually a convex mirror, acts like your telescope. The second part is the one providing you with a wider view allowing for further visibility from the sides of the truck . There was a recent incident in Florida where part of a vehicle’s trailer struck a bus’ driver-side mirror . The driver of the truck continued on and was unaware of what happened, primarily because he never saw it happen! It was good to know that no one was injured and only left a damaged mirror. A good towing mirror could have prevented this from happening. If you pull a trailer or any other transportation accessory on the back of your Ford F-150, regular side mirrors will not be enough to give you full visibility of anything except the very rear of your additional load. There will be a significant blind spot without towing mirrors. Towing mirrors can resolve this safety issue as these are designed to make drivers see further behind your truck and across all three motorway lanes . If you add towing mirrors to your Ford F-150 truck, say goodbye to the drama of guessing whenever you change lanes or make a turn – asking if your hauled trailer is still there or if there is a car trailing behind you. It will increase not only your cargo’s safety, but yours as well and other people who drive near or around your Ford F-150 truck. Did you know that although every state in the United States has their own towing regulation law, all generally follow one primary rule of thumb? For example, Georgia and Illinois require that mirrors should be able to give the driver at least 200 feet to the rear if there’s a trailer attached. There is one common rule that binds them all: the driver should be able to see the entire truck, trailer and the traffic behind it. As already established, having towing mirrors meets this obligation. Of course, if you are still undecided, then you are probably thinking there must be a few disadvantages of having towing mirrors as well. Below we discuss a couple of them, which are very minor and certainly don’t outweigh the advantages! This is one of the most frequent reasons why some drivers choose not to buy a towing mirror – they do not like to have big mirrors sticking off the sides of their trucks or SUVs. If you think it will look awkward without a trailer attached, then you shouldn’t worry. There are towing mirrors on the market that really look great. Some even look like they are really built for your F150 truck or SUV. On the contrary, these big mirrors actually make the truck with a long trailer look more balanced and proportioned. Aside from that, you need to remove the towing mirrors when you are not towing any trailer or transport accessory as it will be deemed illegal . The second one minor disadvantage is in regards to mileage. When the truck speeds up, these towing mirrors, which are large mirrors, can affect the acceleration of the truck. It reduces the mileage by around 0.2 to 0.3 MPG . It is not much of a difference, but you will still have a little increase in your fuel cost. But if you think about it, wouldn’t the safety of the driver and the cargo worthy of this minor increase in gas spending? Looking for great towing mirror for your Ford F-150 can be confusing. As you might have already noticed, there are a lot of options available. Sure you can just pick any of those, but you have to ask yourself – is this worth your money? 1. When looking for towing mirrors, always consider how often you are going to be towing something. For the Ford F-150, portable mirrors are much more advisable as you can easily remove them when you are not towing any cargo . 2. Make sure you consider the size of your trailer. How long your trailer is will determine the height of the towing mirror you are going to buy which will give you the length of visibility that you need. It’s not really helpful if you get the mirror with the wrong size. 3. Remember, not all towing mirrors will suit your Ford F-150 truck. It is important to ask if what you have in mind will be compatible to the truck or SUV that you have. The Amazon product selector is a useful guide if you aren’t sure if the product will fit your truck or not. If you use these simple tips when looking for the right towing mirror to buy, then shopping for a pair will be much easier. The CIPA 11800 Ford F-150 Custom Towing Mirror is the first of the top 5 best towing mirrors for the Ford F-150. This really isn’t surprising because the product was manufactured by CIPA USA, a subsidiary of CIPA-France, which is considered an innovative leader in terms of mirror manufacturing. 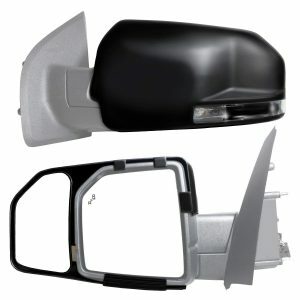 In terms of design, it is designed to perfectly fit the Ford F-150’s standard factory rear side mirrors. It also looks quite sleek and extremely durable. It has dimensions of 18 x 9 x 10 inches that can widen your field of view view up to 48-degrees. It’s aerodynamic design also helps to alleviate annoying wind vibrations (we all know what an annoying sound that can be). Promise us, you will not shed tear when installing this CIPA 11800 Ford F-150 Custom Towing Mirror on your truck. You just need to slide it over the existing mirror and secure it with its wedge lock (it’s super easy!). Another big plus about this mirror is that it is far cheaper than the stock towing mirrors you can buy from Ford directly. 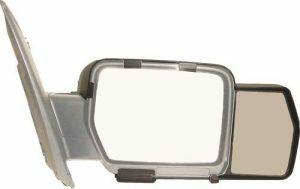 This towing mirror is suitable for a wide range of truck series, including 2004 – 2014 Ford F-150 Light Duty, XL, and XLT truck series. I am sure this second selection will not be a surprise to most, if not all, truck and SUV enthusiasts. It comes from Fit Systems, a brand known for affordable yet amazing products. This product does not fall short of what this brand represents. If you want to buy a great towing mirror at a very practical price, then this product, which belongs to Fit System’s Towing Mirror Extensions, should definitely pique your interest. Worried about mileage? Then, worry not – It also has a very aerodynamic design which minimizes drag; any mileage differences will be negligible. It is also made of amazing materials, including a scratch-resistant glass that makes the product durable and reliable. If you want to save yourself from thinking if a towing mirror will fit your Ford F-150 then you should consider getting this one. 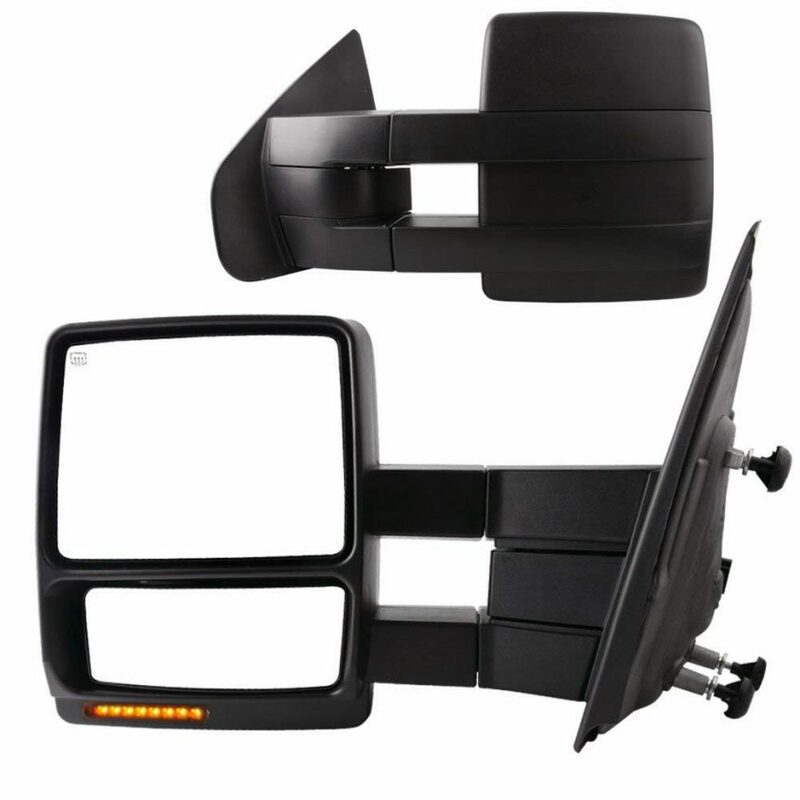 This towing mirror is compatible with all Ford F-150 model series from 2009-2014. Next in our top 5 best towing mirrors for the Ford F-150 is another from Fit Systems. This product suits all Ford F-150 model series from 2015 up to the most recent model. It has a custom fit design with its contours matching those of the Ford F-150’s factory mirrors, which makes this product a sure fit. This prevents vibration and wind noise. Its OE-grade, flat glass, providing a very precise and clear image which can also be manually adjusted. It has a black plastic case that makes it resistant to rust and corrosion. Its glass is also resistant to scratches. There won’t be a need for any hardware to install this as it is very easey to put this on your Ford F-150. You just snap this towing mirror over your truck’s factory mirror, enabling you to use the factory mirror’s setting, which includes turn signals, puddle lamps, LED spotlights, and BSDS camera. It can also be easily removed though pushing in the bottom tab. 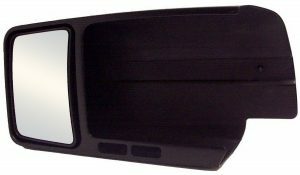 Another contender in the top 5 best towing mirrors for the Ford F-150 comes from CIPA, the CIPA Black USA 11550 Tow Mirror. This towing mirror suit models Ford F-150 models from 2015 until 2019 and trucks and SUVs. 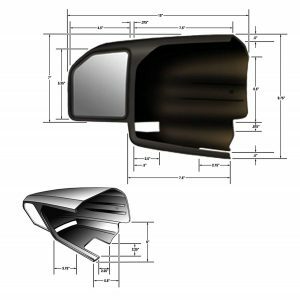 Just like CIPA 1800 Ford F-150 Custom Towing Mirror, it has that custom fit design that you can just slide over your factory rear view mirrors to get that desired increase in visibility. People may not even notice that it is just an addition to the standard rear view mirror. The materials used in this product are top-notch. An ABS plastic and scratch resistant glass are both materials synonymous with longevity and durability. This is also very easy to install on your Ford F-150. You won’t need anything but your hands to do it. You just to slide it over the standard rear view mirror, and voila, you have your towing mirror ready! The fifth among our top 5 comes from Yitamotor, a hi-tech enterprise that specializes in auto parts and car accessories. The YITAMOTOR Towing Mirrors for Ford F150 Power Heated with LED Signal and Puddle Light Tow Mirrors is compatible for 2007 up to 2014 Ford F-150 trucks. Unlike all of the other four towing mirrors reviewed, this towing mirror is meant to replace the original rear view mirrors. It was designed to replace the standard factory mirrors. Key features of this product include Power Adjustments, Heat/defrost (Works with the rear defrost like the original), LED Signal Light, Puddle Lamp, Manual Folding, and Manual Telescoping (From 18.5 inch to 21 inches). It is also very simple to install. How did these 5 products become the top 5 best towing mirrors for Ford F-150? Well, there are two common factors. First, they all address the two concerns mentioned on this page: aesthetic for your F150 truck and mileage. They are sleek, custom-fit and aerodynamically designed. Second, all of these models are very easy to install and remove. We hope this article has been helpful in narrowing down the many options that one has when shopping for a towing mirror for your Ford F-150 truck; please let us know in the comments below. What’s the Right Air or Train Horn for Your Truck?